Thanks to @caitmayart for this art piece! Taliesin was right: character death makes the other characters gun-shy. The Mighty Nein have been considerably more cautious since the Glory Run Road, taking time to plan, discuss, revamp their plan, discuss, confirm their plan, discuss, etc. far more than they have in the past. 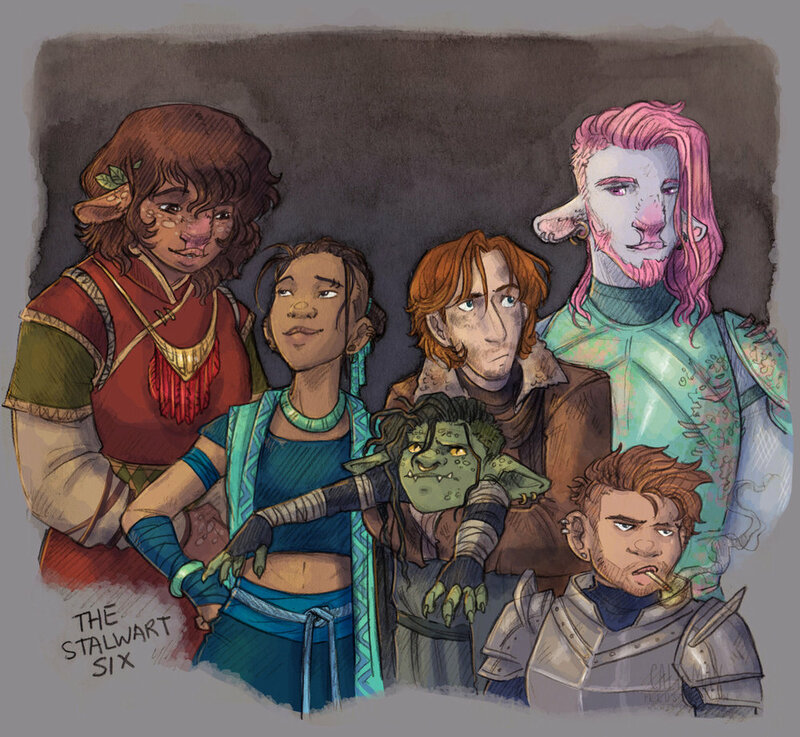 As we discussed last week, their mission is five-fold, but foremost among those goals is their own: rescuing Yasha, Jester, and Fjord. To that end, they took the measured risk of seeking out the aid of one of the strangely regarded clerics outside of the city, who ended up being Caduceus. Luckily, he was more than willing to leave now that he had traveling companions. Upon reaching The Sour Nest again, TM9 elected to forgo one risk: asking a Tasker to aid them in infiltrating at the risk of someone in the town potentially connecting them with the Marduns. By forgoing that risk, they opted to take another: breaking into the stronghold with six people. This is a great example of an encounter whose difficulty changes entirely based on decisions and actions made by the players. Rather than present this solely as a combat encounter, it’s easier to think of the infiltration as a whole, with combat as a subset and potential consequence. Being a skill challenge, there is a fair amount of luck involved, and all actions are a gamble. To paraphrase Taliesin from this past week’s Talks Machina, the game is not whether or not something can be done, but how likely the thing is to be done. On their own, guards presented very little threat. (Heck, they couldn’t even kill an owl or a spider.) Engaged in direct combat, guards only used limited party resources (Caleb’s Hold Person and Haste spells, and one of Beau’s ki points). Their actual threat lies in who they can call to their aid, and how the environment changes when they are aware of what they are guarding against. The initial assault on the exterior guards was extremely effective, taking out both without arousing any suspicion and allowing the party to enter the fortress in the first place. Had this first step failed, the defense in response would have been prohibitive. The interior guards (specifically Not Phil) proved to be perceptive individuals, even if they couldn’t do anything about it. Despite yelling about owls and roaring over arachnids, clanging tankards and pithy insults didn’t gain the attention of the rest of the Nest. It wasn’t until the guards actually laid eyes on Nott that the rest of the house began to mobilize. Wohn was significantly more adept this battle than she was during the Glory Run ambush. This was in part by putting the Magician’s Judge sword to its intended use: dispelling magical effects. From a narrative and psychological standpoint, consider how simultaneously dangerous Wohn became wielding a weapon the party was used to fighting for them, as well as the realization that enemies are just as eager to loot their bodies as the party is to loot those they defeat. It also guaranteed her doom in the party’s eyes, enraged that she would wield Yasha’s weapon. Despite stunning Keg, Wohn responded to the threat of the firecrackers just as the party was mopping up Phil and the guard dead set on killing Frumpkin (and failing), placing the odds not in her favor. She also failed to put her rage to use, accepting her fate as the Iron Shepherds’ alarm system as she screamed to her crispy death. Excellent scouting greatly aided The Mighty Nein in their infiltration. Nila got the lay of the land in her mouse form, which directed TM9 on where to go once they got in. Beau’s Natural 20 perception check after taking out the initial guards ensured that they could continue their progress. Frumpkin can be heavily thanked for much of the success of the mission. From casing the fortress to providing adequate distractions for the guards who may have caught a glimpse of the party, the familiar served his purpose and managed to live despite be arrowed and stomped! Beau and Caduceus stepped into the role of grifter convincingly, much to Beau’s own surprise. This not only allowed the Nein to get to the interior of the Nest undisturbed, but also drew out the guard torturing Nila’s son to the waiting arms of the entire party. The end result: one less drain on combat resources. The firecracker was a mixed bag, in terms of aid. On one hand, it alerted the rest of the Nest who may not have been as quick to respond to the drunken cries of Phil and Not Phil that someone broke inside. On the other hand, Wohn had definitely been made aware before then, and the firecrackers’ location caused her to waste a turn investigating the noise first instead of heading straight to Nott’s location. Nott’s crossbow prowess ensured that the patrolling guard on her group’s side died before he could even react to anything besides the pleasant breeze outside the Sour Nest. She successfully disarmed the trap leading into the basement, but that was the extent of her luck for this skill challenge. The clattering pans caused by her Natural 1 stealth check sounded the alarm that kicked off the inside battle. Caleb’s Haste spells provided a useful initial boost to Keg. Even with the first instance dispelled, the effect was around long enough for Keg to kill Phil and deal some serious damage to Wohn. Perhaps most importantly, Caleb was able to fill in for Nott’s infiltration abilities when her lockpicking abilities failed her, using Knock to magically unlock the doors. He stayed largely out of the way, ensuring that his Mage Armor is still active going into the basement. Fear the firbolg who’s had her family taken from her. Nila was crucial in lifting Beau to the top of the wall to take out one of the outside guards, not to mention her Pass Without a Trace that gave them the stealth they needed to sneak up in the first place. Once in battle, she dealt 38 damage to the guards, and forced open one of the doors The Nein would have needed to unlock to get into the basement. Most importantly, she was able to break open the cage and rescue her son and partner. The Mighty Nein will miss her dearly as they progress forward. How many more guards are within the basement of the nest? Are their friends still imprisoned there, or have they already been sold into slavery? And where is Lorenzo? Is he away… Or is he watching unseen, waiting to strike?